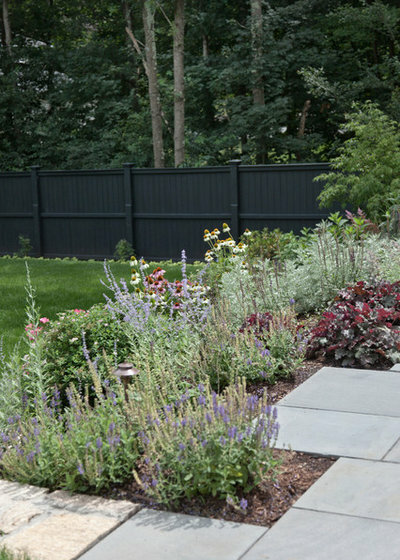 Give tired fences a face-lift with a hue that blurs boundaries and provides a dramatic backdrop for plants. 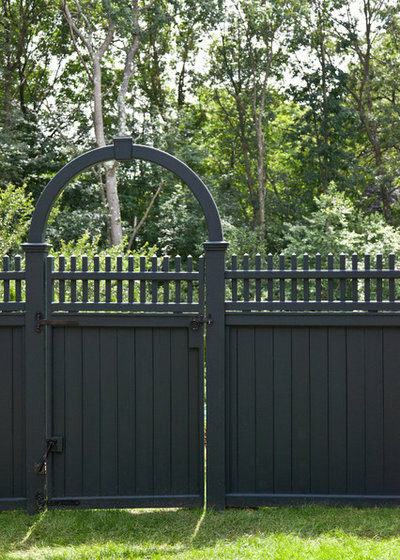 White picket and natural wood fences may be more common, but garden fences painted black can be surprisingly effective in the landscape. Dark fences act as a stunning backdrop for bright green foliage, provide understated privacy where needed and make garden borders disappear. Take a look at these examples of how a dark hue can transform a garden fence, and you may be inspired to get out your paintbrush. Highlight plant structure. Black and charcoal-gray fences work well as backdrops for formal plantings. 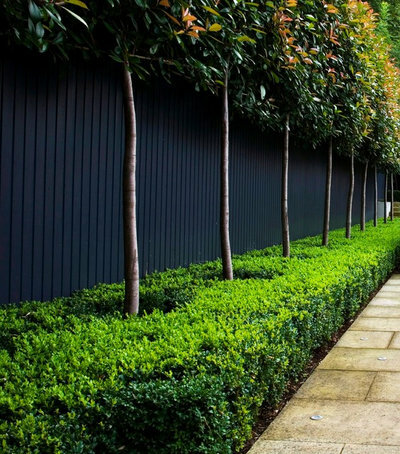 The dark hues look elegant and sophisticated, and provide a stage to highlight the form of espaliered trees and clipped hedges. Here, a dark fence serves as a backdrop for a double-tiered hedge of clipped boxwood and photinia shrubs trained as small trees. A white fence in the same setting would draw the eye more than this dark one, taking attention away from the form of the planting. Make property boundaries disappear. Dark fences visually recede, reading more like the shadow cast by a tree than a man-made barrier. To further draw the eye away from property borders, plant beds in the foreground with silver and pale green foliage. Provide understated screening. Far less stark than white, black can be a more effective color for subtle privacy and screening. 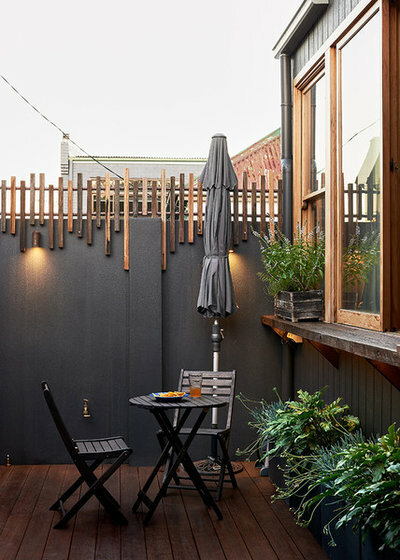 Here, black fences enclose an urban terrace to screen surrounding buildings and create an intimate gathering place. 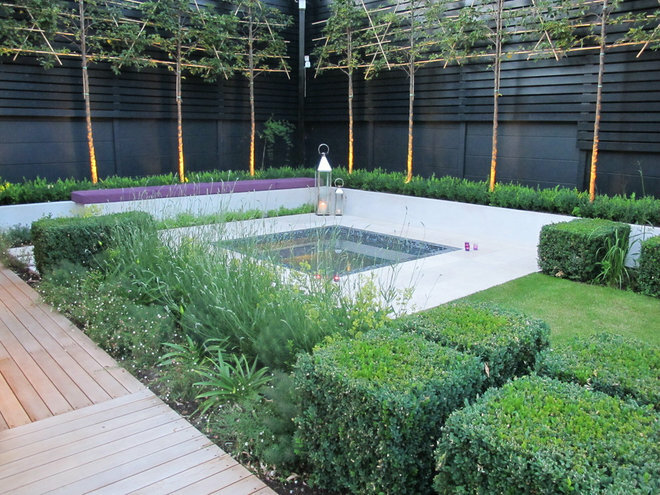 In this garden, dark fencing provides an elegant screen to hide the home’s air-conditioning and utility units. Variegated New Zealand flax, feathery grasses and a simple water feature also help draw attention toward the garden. Show off spring blooms and fall color. Deep forest-green fences can work just as well as black to provide a dark background for pale blooms. 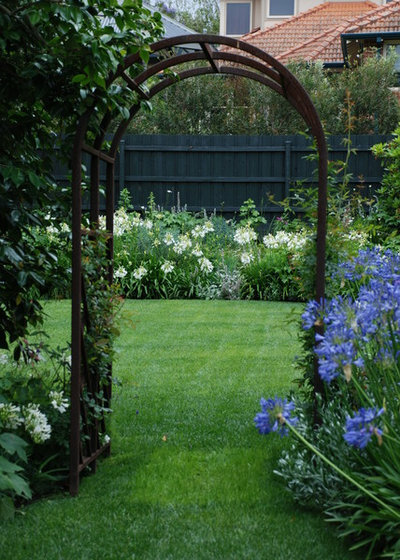 In this garden, white and blue agapanthus blooms nearly float against the deep green backdrop. In fall, dark fences complement the rich colors of changing leaves, highlighting gold and orange tones and creating a moody pairing with plum and burgundy foliage. 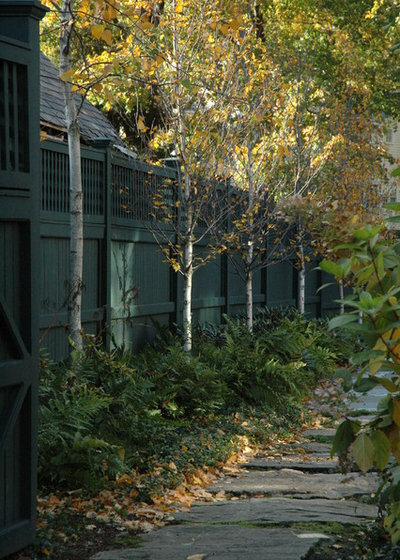 Here, a dark green fence sets the stage for a fall show of golden birch leaves. Make small gardens feel bigger. White fences or walls enclosing a small space can feel confining, while darker hues tend to visually sink into the background. In this garden, a small deck outside the kitchen window has just enough room for a cafe table for two. Painting the wall a medium charcoal and adding subtle down-cast lights make the space feel larger and more inviting. 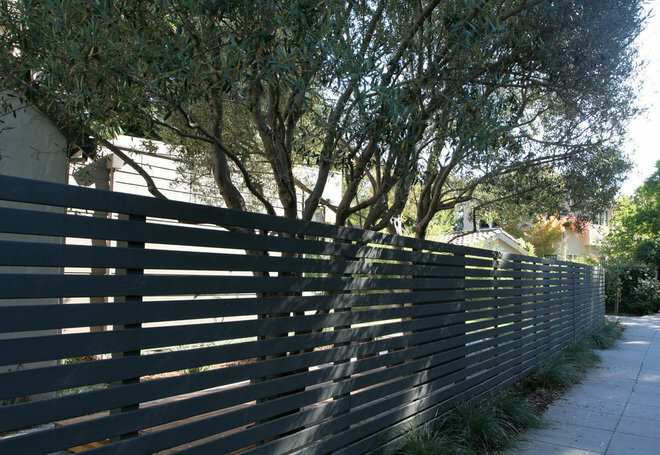 Give property fences a contemporary edge. A fresh coat of dark paint can transform a simple border fence into a landscape feature that sets the tone of the garden upon arrival. 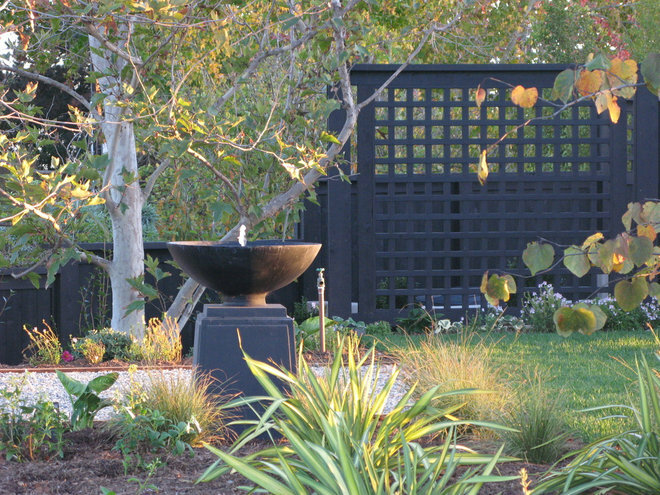 Dark paint also can be used to integrate traditional elements of a landscape with those that are more modern. 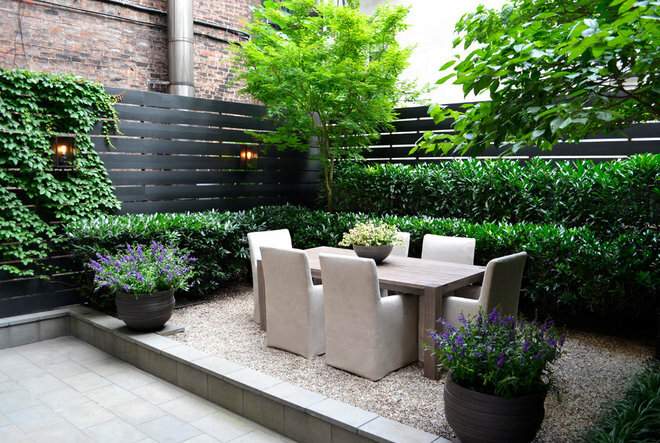 For example, in this garden a dark stain gives a classic fence design a fresh, contemporary look. Update your kitchen garden. Giving fences a wash of dark paint can create an entirely new look. 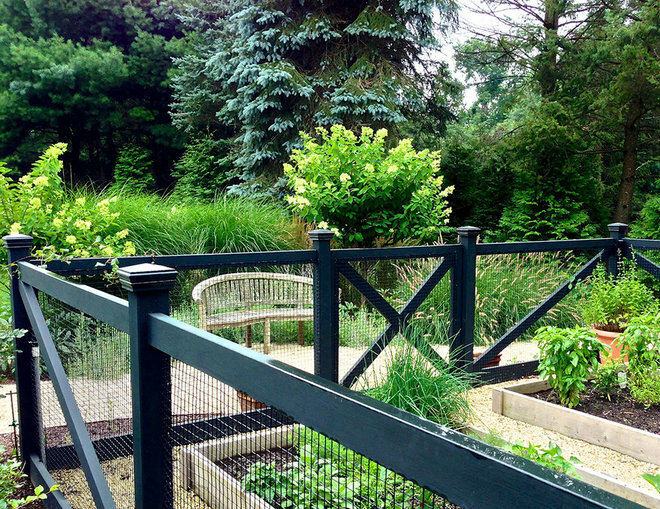 In this kitchen garden, a dark coat of paint and end caps on the fence posts elevate the perimeter fencing from being purely functional to an attractive design feature. 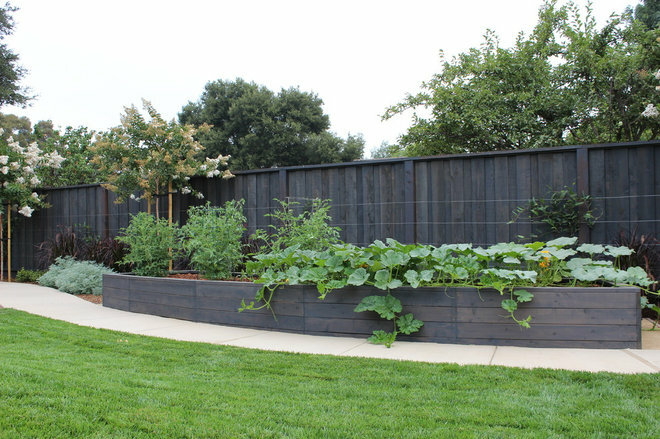 Likewise, a few coats of a dark semitransparent stain over the fence boards and raised bed give a contemporary feel to this edible garden. Plus, the dark backdrop highlights the form of a squash vine spilling out of the raised bed.